FATAL FOODIES: How Did You Find Your Fish, Madam? How Did You Find Your Fish, Madam? I looked under the Lima beans. Frozen tilapia. Melt margarine in a skillet. Sprinkle the tilapia with seasoned salt and dot it with margarine. Maybe sprinkle on some celery leaves and parsley. Put it in the hot skillet and cook it on medium heat for about seven minutes. When the margarine gets melty, sprinkle thickly with seasoned bread crumbs. Turn it over and cook it for about seven more minutes. The bread crumbs get all toasty and the tilapia thaws and cooks just right. 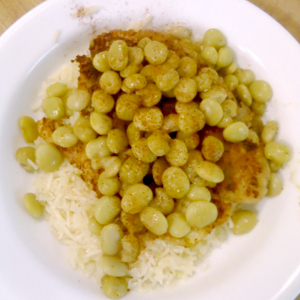 I put the tilapia on the rice and the Lima beans on the tilapia and paprika on the beans.